Long before the first slave ships started supplying labour to the cotton plantations of the American south, and many centuries before the first Africans were brought ashore to the sugar estates of Brazil and the Caribbean, Africans were being sold as slave-soldiers for India's princely states. 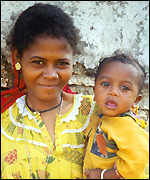 Their descendants are the least visible part of the huge African diaspora. But today in India, almost lost among the mosaic of different cultures and communities in that country, are tens of thousands of people of African descent. They are known as Sidis. Although they came at first as slaves, they were so successful as fighters that they at times usurped power from the rulers they were supposed to be serving. Yet they are now struggling at the margins of Indian society. "The Sidis are descendants of African slaves, sailors and servants, and merchants who remained in India after arriving through the sea trade with East Africa and the Gulf," says Amy Catlin of the University of California, who is making a special study of Sidi culture. "That was a process which began in the 12th century or before, and lasted until the late 19th century". Some Sidis are keenly aware of their past, and a few remain in touch with relatives in Africa. 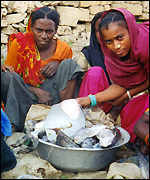 But in the western Indian state of Gujarat - where most Sidis live - the community has lost touch with its roots. The village of Jambur, deep in the Gir forest, is one of two exclusively Sidi settlements. The headman explains that yes, everyone in Jambur is a Sidi. Their forbears came from Africa. But they have lost any knowledge of African languages, and don't know where exactly their ancestors came from or why they settled in India. 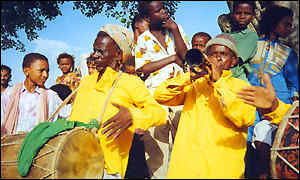 The only remnant they retain of their African lineage is their music and dance. This is what Professor Catlin, an ethno-musicologist, hopes to use to fill in the story of the Sidis. "In Gujarat, affinities with African music include certain musical instruments and their names", she says, "and also the performance of an African-derived musical genre called "goma". In the nearby town of Junagadh, a smaller group of Sidis lives alongside the shrine of Bava Gor, an ancient Sufi Muslim holyman who was himself of African descent. Their hold on their African past is a little more secure. They say they know a few songs in an African language, but not their meaning. And their dance is more obviously African. But again, their music, song and dance are the only links with their African past. Amy Catlin believes that the Sidis of western India came from coastal and inland villages in east Africa which were raided by slave traders. But that's far from certain. Indeed, one legend has it that the Sidis of inland Gujarat originally came from Kano in northern Nigeria, and ended up in India after undertaking a Hajj pilgrimage to Mecca. Music may be the only key that can unlock their past.